One of the biggest transitions in a person’s life is when they venture out on their own, leaving their parents and begin to take care of themselves. For many, this takes place when they graduate college or even high school. By focusing on starting off your life with some of the tips I mention below, you can build a strong financial foundation for your future. Most of these tips come from my own experiences after college. I moved thousands of miles away from home to start a new job and life. If I would have followed all of these tips instead of just a few, I would have been able to pay off my debt faster and follow my passions more easily. While living at home is a great option for those who get a first job close to home, mine took me well across the country to a city I’d only been to once before. I only spent a brief amount of time looking for a place to live once I got out there, even though I knew months in advance where I was going to be working. I looked at four apartment complexes and picked the most expensive of the bunch to live in. Why did I pick it? Well, because it was the nicest and biggest. I didn’t know what I actually needed in the first place of my own. I went from living in small dorm room with another person for four years to a full size apartment. My mind raced with what I could do with all of the space. I realize now what my biggest mistake was. I didn’t plan ahead for my needs or budget before I went apartment hunting. If I were to do it again I would only look for a small upgrade from what I was used to living in before. Because I rented a larger apartment, I wanted to fill it with furniture. Luckily, I got a lot of furniture handed down to me, but over the years I spent thousands furnishing my 700 square feet. If I would have just gotten a small studio or mother-in-law apartment that cost less I would have saved money in both rent and in buying furniture. I don’t mean pulling all nighters because you procrastinated studying or drinking on a day just because it ends in Y. What I mean is realize that you don’t really need a lot of the things that you think you need to spend money on now that you are out of college. You spent the last four plus years without being able to buy certain things, why should you buy them now? You might feel rich when you get that first paycheck, but establishing good money habits early is a key to financial success later in life. Put off some of the major purchases you have been eyeing while you were in college for a few more years. The fancy laptop, television or wardrobe will still be there when you can actually afford it. One caveat I would make to this tip is that you shouldn’t eat like you are in college. Or, at least don’t eat like I did (e.g. midnight pizza or tacos every night). There is always going to be someone else out there that has more money than you or at least acts like they do. A new expensive car, a bigger place to live, ritzy clothes or the latest gadgets are not what you need. It is necessary to figure out exactly what you spend money on that gives you value in life. You should not spend money on possessions or experiences based solely on how others will view you. I still catch myself thinking like this today, but my earliest memory of this was when I was a kid and collected basketball cards. My favorite cards to collect were Michael Jordan cards. I had upwards of fifty different kinds of MJ’s. I had a close friend that also collected them and I mainly wanted more of them to compete with him. After I realized I was collecting them for the wrong reason, to beat my friend, I traded him some of mine and the hobby slowly faded away. Don’t buy something just because you think you’ll look cool if you have it. Buy it for you. This principle will save you a lot of money over the course of your life if you can convince yourself to follow it. In school, your social circle may be based off of many different types of things. You might be live by each other, play on the same sports teams or have the same class schedule. When you venture out of the school environment, spend some time focused on finding friends that have similar belief structures as you. It can be dangerous for your finances to be friends with people that live off their credit cards, always buy into the latest trends or take extravagant trips they can’t afford. Fun can be had just as easily by spending less money in the company of friends. Focus on deep friendship and relationship building and avoid groups of friends that aren’t conscious of their finances. If when you first finish school you decide to not purchase all new possessions, you can save yourself a lot of money. By taking hand outs from family and friends you can furnish a large amount of your place for free. If you need a single piece of furniture or an appliance, look online or in the local ads for used options. Whether it’s a $5 coffee table or a $15 vacuum, living a simple life to start is a great way to save money. When you do decide to purchase something new, do plenty of research on it and work to sell your old item on eBay or Craig’s List. There are people out there that will buy anything if you have the patience to sell it to them. As I mentioned in yesterday’s post about emergency savings, the best way to meet a savings goal is by making it automatic. When you first start your job set up your direct deposit to put a certain amount into your retirement and other savings accounts. Do it right away before you get used to seeing that money in your checking account. Once you do this you will never look back. The last advice I would give to recent high school or college graduates, or anyone going through a major transition in their life, is to not feel like they are entitled to anything. 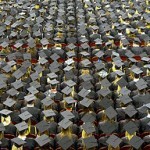 Nowadays a diploma at any level doesn’t guarantee a job and doesn’t mean you are automatically better than anyone else. Gaining a degree in any field in an admirable and remarkable accomplishment, but it alone is not enough to stand out from the crowd. By losing the sense of entitlement that some people get, an individual can have a mental shift in the way they view the world of work, money and careers. Once they realize that it is up to them to seize the moment and possibly create a career out of nothing, they will learn that they should never take anything for granted.